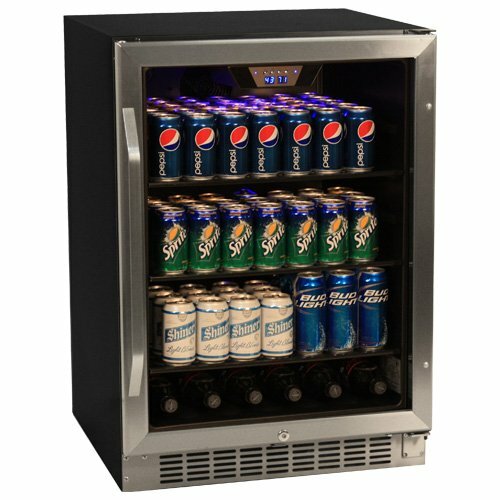 If you are looking to get yourself a decent & sound mini fridge for your beer & beverages -- keeping them all refreshingly ice cool & all close by and at hand (personally I keep mine in the projector room, for when the lads come around to watch the football), then you have come to the right account. Below, is a showcase of some of the best compact fridges for beer & beverages on the market, and hopefully you will come across one that is ideal for you (and at the very least find something that is on the right track as to what you are after). 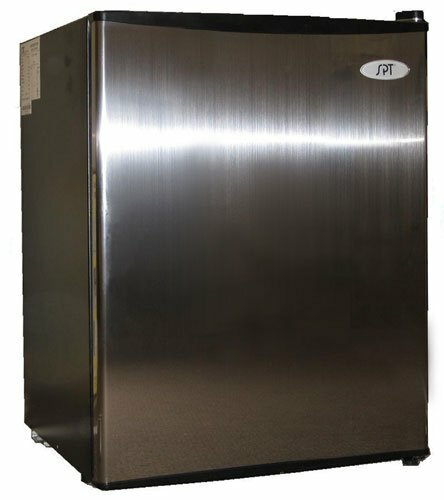 I thought I would start with pretty much the 'all singing & all dancing" beverage fridge -- the DBC120BLS from Danby who are well known brand for making quality appliances & in particular mini fridges that are highly regarded. And this DBC120 is pretty much their best in the range for keeping beers. It can store & keep cool up to a hundred and twenty cans within its 3.3 cubic ft storage space. Fitted with a glass door (with integrated locking system & reversible hinges) & stainless steel out trim with illuminated lights makes it look pretty sleek & modern too -- certainly doesn't go look out of place in almost any room. This is definitely my personal favourite mini fridge for beers (since I have one) & for many others as well, just check out the high proportion of 5 star reviews on Amazon and such review sites. If you are really unsure as to which one you want & what you are after? You won't be disappointed with this model. Another very decent model that is specifically designed to be on the more smaller & compact side of mini fridges to store beers & beverages is the BCA184BG from MAS Inc that can store away around 60 cans -- so half that of the Danby above and it is also a fair bit cheaper as well costing around $50 less. In terms of design it is again rather stylish with a black lined finish and an interior that is pretty standard so can be fitted in most homes, pool areas, events etc. Moreover, it has a reversible hinged glass door & is particularly highlighted as being quiet in operation too. You get full range temp control & in all does its job well i.e keeping your beer cold. Ultimately, a good option if you are only after a few bottles been kept cool (like a lads poker night) - not too ideal for events & parties however. This model from EdgeStar is for those who are looking for the absolute 'best' in mini fridges for beers - it is easily on a commercial standard (i.e many bars, restaurants would get this kind of standard of beer fridge) & it really does have everything you could ever want from a mini fridge & so much more (and so you would expect really given its pretty high price tag). To start you can fit 148 cans, which is plentiful for a decent sized gathering, keeping them all incredibly cool (within a temperature range f 38-50 degrees farenheit -- with use of digital controlling). It also looks really cool being fitted with glass shelves, an incandescent lighting system for your beer & drinks, along with fitted carbon fiber and comes with an industrial lock. This is going to be fo show more than anything however. Although, not a traditional mini fridge designed specifically to hold beer it is a great all round model that offers pretty much the best value on the market (easily demonstrated to be the market leader in the mini fridge range -- with the highest rated reviews from over 200 owners). Where for just under a $120, you are provided with a compact fridge that actually keeps beers cold, is quiet in operation, can store a fairly decent amount (around 50 - 60 beers), is completely customisable (so you can take out shelving and attachments to create more room) & with a fitted lighting mechanism. Moreover, it comes in a rather modern & sleek looking black metallic. 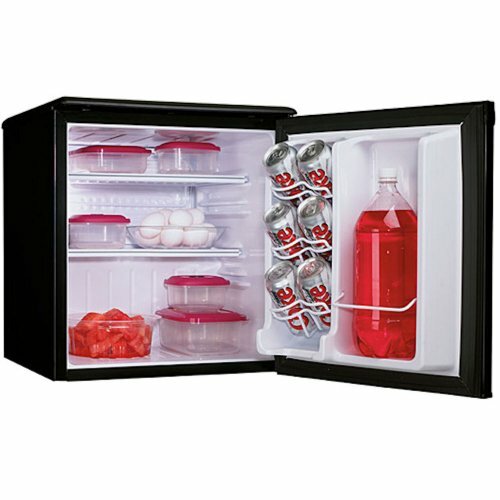 If you are wanting to use the compact refrigerator for other purposes too (other than storing beer e.g. like food etc.) then this is a great option for you. Like that of the Danby DAR195Bl this mini fridge is not specifically intended for just holding beer but it can of course be adjusted with the re-arranging of shelves etc. to soley stock beer & is a little larger than the above model by 0.7 cubic ft (hence can store around 70-80 cans). It comes in a great stainless steel design too, so certainly looks the part & is pretty much the perfect size for most tasks -- whether it is just enjoying a beer with your mates or for hosting a little event. So like that of the Danby above, just a bit larger so can store more food & drink etc. also a bit pricier too mind. Also remember getting a Smart Guard protection plan (e.g. the two year coverage plan) is a good idea in tandem with your mini fridge purchase covering both parts & labour as well as a replacement guarantee on every product. You will see this particular plan covering $0 to $200 bought with many of the models mentioned above. Be sure to let me know which one you choose & why. Also, if you have any questions, comments or concerns at all, either regarding the showcase account of the best mini fridges for beer or about any of the models specifically (e.g. technical details etc.) then please do not hesitate to make them in the comments section (that you will find just below) and we will be sure to respond to you as soon as possible.